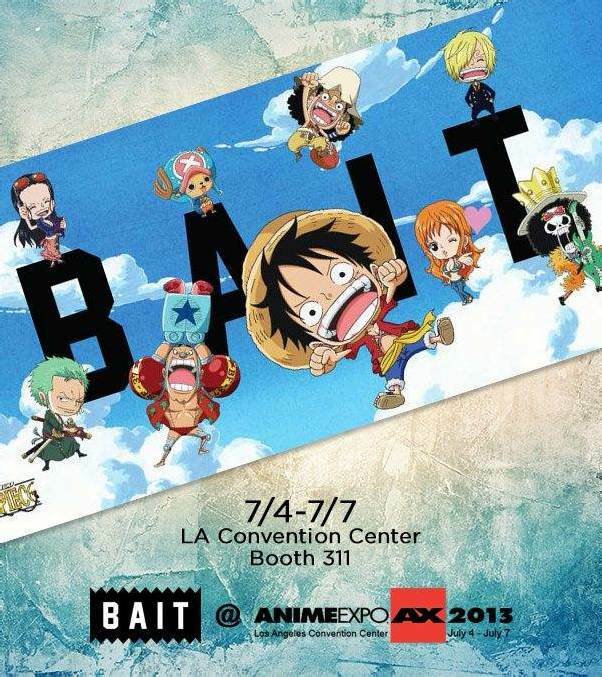 BAIT at Anime Expo 2013 – Giveaways and Deals! BAIT will be hitting Anime Expo – North America’s largest anime, manga, and Japanese culture convention – this holiday weekend with exclusive items and special deals! BAIT will be at booth #311 at Anime Expo, which is taking place at the Los Angeles Convention Center from July 4 through July 7. Our booth will feature some of BAIT’s most popular collaborations with Spongebob x Creative Recreation, One Piece, ASICS, and Mitchell & Ness plus a range of our own tees, hoodies, raglans, caps, and sweaters. We’ll be offering a special apparel deal at the booth: buy three BAIT apparel items (excluding footwear) and get one free! There will also be a number of exclusive giveaways for convention-goers. A free BAIT lanyard will be included with ANY purchase from the booth. Additionally, a free limited-edition BAIT x One Piece bag will be included with any purchase from the BAIT x One Piece Apparel Capsule; a free Spongebob keychain will be included with any purchase from the BAIT x Creative Recreation x Spongebob Footwear Capsule. Click here for information on how to attend the convention. Be sure to check out the schedule of concerts, panels, competitions, EDM afterparties, and other events so you don’t miss out!